Donna Leon and I have a strange relationship. She’s nowhere near the top of my list of favorite detective writers, yet I’ve read six of her Commissario Brunetti mysteries (sort of how I really don’t like Rent all that much, yet through an odd combination of circumstances have seen the show three times). Her books always leave me feeling unfulfilled, even though at this point I should know better than to expect miracles from them. But I keep coming back to her books, hoping to find that really great one that I know is hidden in the series, and I do this for one reason: Venice. Much in the way that I would happily watch paint dry if the narrator from Bridezillas was providing commentary, I will read just about any book that takes place in Venice. It’s a killer setting, especially for a mystery, and despite all her weaknesses as a writer, Leon uses the setting to its full potential in every book. Which is all a long-winded way of saying that when I found this book, I was delighted – Donna Leon discussing Venice, without the distraction of her half-baked murder mysteries and useless filler scenes? Sign me up. The book, as the “Other Essays” part of the title suggests, is about more than just the author’s experiences in Venice (where she’s lived for over twenty years). 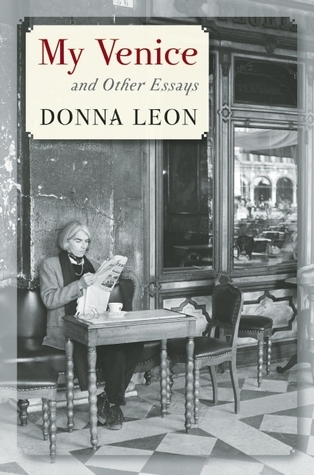 There’s a lengthy section on opera, some stories about Leon’s country house in Italy, a lot of essays bashing the United States, and a few essays that get into Leon’s childhood and frankly fascinating career history (she was living in Iran at the time of the revolution, and also did a teaching stint in Saudi Arabia – Donna Leon, I am delighted to report, is a badass). My only complaint is that many of the essays feel too short. They’re more like anecdotes instead of fully-formed stories, and there are potential essays hidden within the text that I would have enjoyed reading. In one of her opera pieces, Leon gets to the end and mentions that when she was at the reception, she started imagining how a murderer would escape the room, and says that this is one of the perils of being a detective writer. I could have read an entire essay about how Leon can’t stop imagining grisly murder scenarios everywhere she goes, but instead it’s tacked on at the end of a completely unrelated essay, which was frustrating. She also has some essays about writing at the end of the book, including some advice on writing detective stories. I enjoyed this, although she seemed to have sort of a dismissive attitude towards the detective genre (I forgot to mark it, so I can’t quote the line directly, but I remember her implying that mysteries are not “real” books). It was weird to watch Leon essentially bite the hand that feeds her, and it made me wonder if she only started writing mysteries because of the money, which makes me sad. Although it would explain why none of her books have managed to impress me so far.